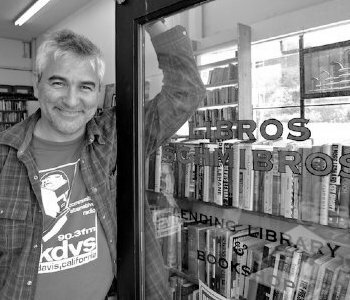 Colin Marshall sits down in Boyle Heights with David Kipen, founder of that neighborhood’s combined bookstore and lending library Libros Schmibros and a true man of both letters and Los Angeles. He gives commentary on books and literary culture on KPCC-FM and Sirius XM’s The Bob Edwards Show, he’s written the book The Schreiber Theory: A Radical Rewrite of American Film History, he recently translated Cervantes’ The Dialogue of the Dogs for Melville House Books, and he spent over four years as the National Endowment for the Arts’ Director of Literature, where he got their Big Read program started. They discuss how to sell paper books in neighborhoods the Kindle hasn’t penetrated; his interest in getting into conversations about books on both the low-profile person-to-person level and the high-profile media one; whether we have indeed left an actual lost golden age of American reading; the lack of “slack” in American life to use for reading; how rail makes up a city’s skeleton, and how Los Angeles’ skeleton is growing with new additions like the Libros Schmibros-proximate Gold Line; 1939, the annus mirabilis of Los Angeles literature, and the city’s modern desire, as exemplified by Mike Davis’ City of Quartz, to fetishize its own depredations and destruction; whether it’s hard to keep your mind in the narrative of this city, where even the natives have to immigrate; and that undervalued observer of Los Angeles and the whole of California, Thomas Pynchon. This was written by Colin Marshall. Posted on Thursday, July 12, 2012, at 9:51 pm. Filed under Notebook on Cities and Culture. Bookmark the permalink. Follow comments here with the RSS feed. Post a comment or leave a trackback.